Stormy seas are a regular and spectacular event in Cornwall in the winter months. The MetOffice have predicted another nine in the winter of 2017/18. Towns in West Cornwall, are battered by massive waves and high winds every year. The drama of the ocean swell is mesmerising and brings thousands of visitors to our seaside towns to take in the site. Porthleven is no exception! We love storm watching! We’ve chosen four of the best places to watch the fury of the Atlantic ocean in a high storm unfold in West Cornwall. swell crashes over the harbour wall and clock tower and onto the beach, offering a vastly different atmosphere to the family friendly beach of the summer months. Walk along the cliffs toward Looe Bar, to take in views towards the Lizard and the waves crashing in the distance. Or, shelter in The Ship Inn overlooking the harbour pier, get close to the action and grab a coffee in front of the fire on comfy sofas at Nauti-but-Ice (enter in between waves!) or book into one of our holiday cottages with a view of the sea to keep cosy and warm while watching from your window. Sennen Cove, near to Lands End, is our second location for watching the rollers come in. Watch from the safety of the top car park or drive into the village to get into the thick of it. If you park at the far car park in Sennen village you can take a walk up the cliffs to the beautiful and stormy views over to the lighthouse at Land’s End. 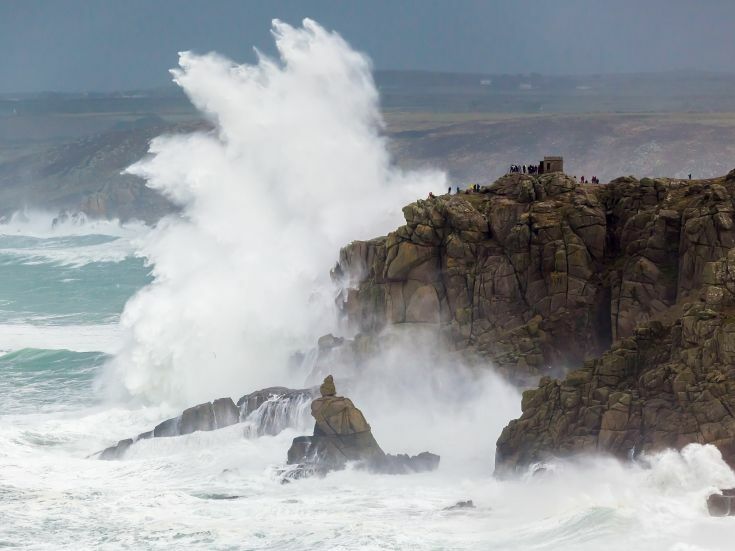 Watch this video of the stormy seas around Land’s End! Prefer watching from indoors? Take a seat overlooking the beach at the Ben Tunicliffe’s restaurant. Or, for a cosy hideaway on the promenade, try Apple Tree Cafe. The very high cliffs above Porthcurno beach give spectacular views of the Atlantic. When the swell is high, it is probably better to avoid the beach and go up to the Minack Theatre café and enjoy a proper cream tea. Just half an hour from Porthleven, is the remote and extremely beautiful, Lizard Point. On a stormy day there is no better place to be than the Polpeor Cafe. If you don’t fancy walking the cliffs then this is a lovely, friendly cafe to enjoy the storm from inside. A word of warning! The waves get very big and the winds are high. It is easy to lose footing on the cliff paths and even the strongest of us can get blown over. If you are walking, wear sturdy footwear and a waterproof coat. Don’t take any chances on our cliff paths. 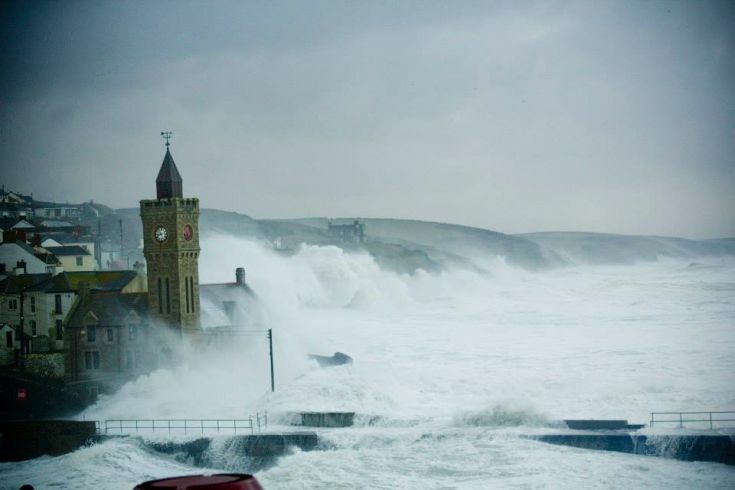 If you come to Porthleven to watch the storm, you may find the roads to the pier closed. Next time there’s a storm the size of Imogen or Brian approaching, get in touch with us for offers and short stays. Find a cottage to stay in for a storm watching adventure!